Lanollin rich Corona Antiseptic Ointment treats injuries, irritations, and abrasions. Corona Antiseptic Ointment helps to moisturize and protect dry dog paws, horse hooves and frogs. Non-toxic. For minor wounds: clean the area and apply a thick coat of Corona at least once daily. Repeat as needed. For the Hoof: Clean with a stiff, dry brush. Apply corona daily to wall, frog, and sole to maintain proper moisture balance. 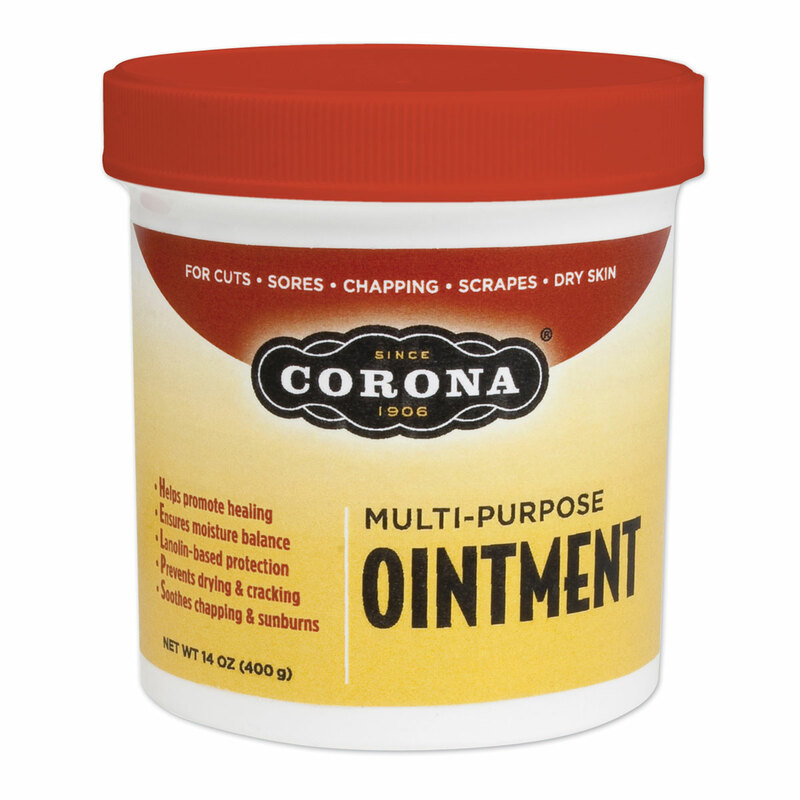 Corona Multi-Purpose Ointment is rated 4.7 out of 5 by 60. Rated 5 out of 5 by Jacq from Lanolin I started using up a jar from horse use to hand, foot & elbow cream. I used to bring back lanolin cream from New Zealand & everyone I gave it to thought it was wonderful. This is close to it. Really really makes your skin soft & happy! Much better deal on SmartPak too! Rated 5 out of 5 by Michelle from Soothing and healing My horse was having some skin irritation and peeling on the chest area from gnat bites. I found this ointment helped to heal the skin and provide a layer of protection from the bugs. Also, I purchased this product in the past in a tube form, but I like this container much better. Rated 5 out of 5 by jdlex from Great product Easy to use, doesn't require gloves, and has healed up my horse's muzzle rubs within days. Rated 5 out of 5 by Nessa from Still Great After All These Years Started using Corona when I was 11, and light years later it's still a staple in my stable. Rated 4 out of 5 by LK McConnell from Good product Does it’s job, makes thing easy when I have a multi purpose ointment in my tack trunk. I use this on anything I don’t use vetericyn on. If I have a horse that is not used to being sprayed around the face, this ointment works well. Rated 5 out of 5 by AnneH from Love this product! If you have only one product in your tack box this is it! Rated 5 out of 5 by Jeanine from Love this stuff! I've been using Corona ointment on a horse who gets horribly itchy and scabby from bug bites. I rub it all over her belly in the mornings before I turn her out. The ointment has really helped heal the scabs and I think it also helps work as a barrier against more bites. I top it off with a smear of SWAT to further discourage the bugs. The ointment smells so good and it seems to feel good to her when I put it on. The roughness and scabs have totally cleared up and her skin feels smooth and normal. I love that it comes in a larger tub (better value) and not just the tube. Rated 4 out of 5 by SueS from Great for dry hooves This works better to moisturize hooves compared to any of the hoof dressings out there. During this summer's bad drought, my horse's hooves have stayed moist and have not chipped thanks to frequent applications of Corona Ointment. Works much better compared to even the Corona hoof dressing. Even the best hoof dressing didn't work as well as this in keeping her hooves moist. I gave a 4-star rating instead of 5 stars because it's a little messy to apply.